Have you ever experienced being caught unawares because you weren’t prepared? How many of us were surprised by the floods of Ondoy? How many of us failed a surprise quiz because we did not study? If we experienced these, we know what the readings today are talking about. The Gospel has one point. The challenge of constant readiness for the coming of the Kingdom is at the center of the test of faith. In parables, Jesus tells us that there is no definite time and no exact date when He will come. In the parable of the return of the Master from a wedding, the coming of the Master is certain, but the time when He does is not. In the parable of the thief who comes in the night, the coming of the robber is not even certain. The book of Wisdom in the first reading tells us that our forefathers know for certain that there will be a time when they have to leave Egypt, but they do not know when the Lord will summon them to leave immediately. It is the same with Abraham in the second reading. 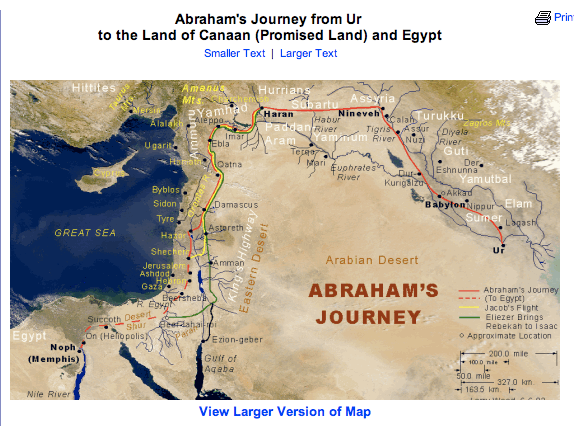 By faith, Abraham do not know where God will lead him, but he has to pack his belongings and journey from Ur to the land of Canaan (see picture). What these readings demand of us is clear: Be prepared. Be like the one who gird his loins. The long flowing robes of the East is always a hindrance to work. So someone who will be working will gather his robes and tuck them in their girdles so that nothing can encumber them in their work. When we think about the coming of the Master, we can think of two meanings. It can mean the Second Coming of Jesus (The End of Time) or our own physical deaths. When we contemplate on our own deaths, we can also mean certain events that might happen that threaten our lives. Close to the latter are natural disasters that claimed several lives and devastated huge properties. What then should be our attitude? First, do not procrastinate. What we can do today, we should not postpone for tomorrow. We have to accomplish the daily task that has been given to us. No work should be left unfinished. Sometimes it is dangerous to think that we have plenty of time. Usually we find ourselves cramming. Second, have clear and realistic goals. It is better to have a few things for the day than to have a long list that paralyzes us. When we have so much on our plate, we usually get overwhelmed. And when we are overpowered, it is easy for us to be defeated. We don’t get things done. Finally, grab every chance you get to be better. We are to blame when opportunities come, and we don’t take them. Usually they don’t return. In other words, gird your loins and work.